Is there a keyboard shortcut key to select all the text in the current cell in Excel, if you are in the process of editing the cell? ⇧-alt-Down to select from the current location to the end of the line. Note that in later versions of Excel, the “Windows” equivalents, made by substituting the alt for control, also work. When the undo function puts the text back into the cell, all text within that cell is automatically highlighted. Then you can just type Cntrl+C to copy text only. I found that I needed to highlight all text in a cell in order to be able to paste it back inside another excel sheet whose cells already had other text that I had to leave intact. Select cell in question, hit any character to replace contents of the cell. Then hit ⌘Z to undo and boom, contents selected without any formatting! I read this as 2 questions. Q. Is there a keyboard shortcut key to select all the text in the current cell in Excel? 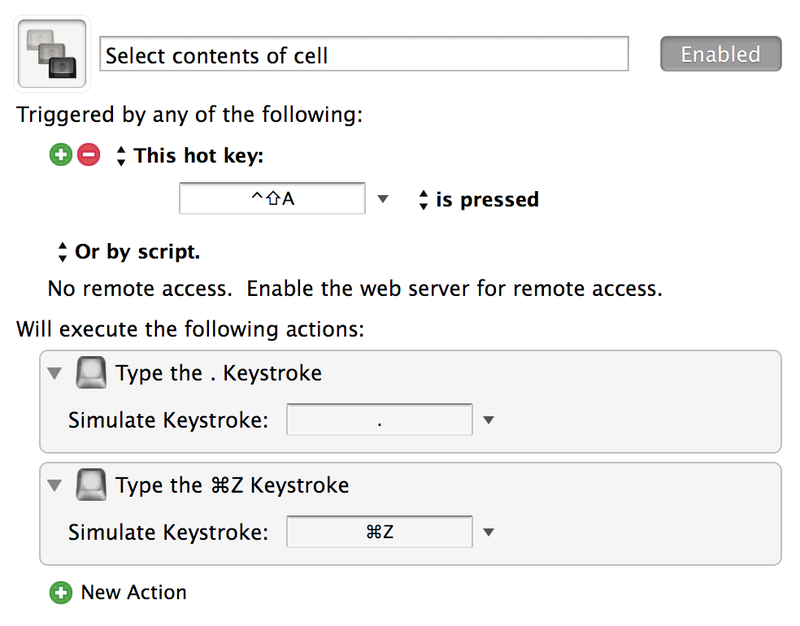 A. command+c for Mac or control+c for Windows while the cell is selected. Choose a new cell and command+v or control+v to paste. Q. If you are in the process of editing the cell? A. It is a two step process, command+a or control+a to select all, then command+c or control+c to copy. place the cursor at end of contents and hit ⇧ shift + home. Press Ctrl + Shift + Home. All text from the end to the beginning will be selected. Note it doesn't work if you enter the cell by writing on it, you have to edit. Click on a cell or navigate to it using the keyboard. Do not double-click or not enter edit mode. Do not try to select anything. If you are already in edit mode for some reason, hit Esc. There is no direct way. Please refer the official page for this. Use of native methods (go to end, use SHIFT+Arrow keys)... wondering why ^A is not supported there. MS S**ks sometimes. Not the answer you're looking for? Browse other questions tagged ms-office . How can I use Keyboard Maestro to select all content in an Excel cell? Stop Excel for Mac (2011) continuing formatting from last cell entered?